As promised, today we’ll look at the 5th cheese within our little series. Of those we’ve covered thus far, today’s cheese is the most complicated to make and, if that’s not enough, it’s also brined. All of this can add up to problems for the unaware — but that’s not us! No, my cheese making amici, you heeded my advice, making at least one of the “easier” cheeses in this series, and now you’re ready for a challenge. Today we’re making feta! It’s just a salad without feta. Feta cheese is most closely associated with Greece and, according to European Union law, only cheese made in Greece may be labelled and sold as “feta.” Typically made with sheep’s milk alone, the Union will allow up to 30% of the milk to come from goats. Although first mentioned in the 15th century during the Byzantine Empire, it would be a mistake to think that feta was — and is — only produced in Greece. Brined cheeses have a longer shelf-life than many of the “soft” cheeses and, as such, are fairly common throughout the Eastern Mediterranean, as well as other areas around the world. Depending upon availability, these cheeses can be made from the milk of cows, goats, sheep, or some combination of the three. During a recent broadcast of America’s Test Kitchens, various brands of feta were tested. They found that imported feta was stronger tasting than domestic. The blandest feta cheese came from cow’s milk. Goat’s milk produced cheese with a bit more flavor and sheep’s milk cheese was strongest of all. Bear in mind that virtually all store-bought feta uses raw milk and that isn’t always available to us rookies. We’re left with pasteurized or, worse yet, ultra-pasteurized milk and either process destroys many of the subtleties in flavor that distinguish the 3 milks. Now, you may be lucky enough to get raw milk for your cheese but, as I’ve already lamented, it’s illegal to sell raw milk in Illinois and there’s a dearth of lactating sheep in greater Chicagoland. I do know of one milk producing ewe but, distance aside, her milk is already spoken for. So, because we have to use pasteurized dairy products, don’t be surprised if your home-made feta tastes rather bland in comparison to your favorite imported feta made from sheep’s milk. Thus far, we’ve made cheeses that were pretty straight-forward with mistakes a rarity. Many of the steps used for those cheeses will be repeated here, when making feta, but a few more have been added and there’s a greater chance for error. This will be a long post but if I don’t warn you of the pitfalls, you might end up dumping your dairy down the drain and starting over. Who wants that? First off, we need to talk about the milk. In short, you cannot use ultra-pasteurized goat’s milk to make feta. As it is, goat’s milk creates softer curds than other dairy, so you’re already at a disadvantage. When I used ultra-pasteurized goat’s milk, I found it impossible to get a clean break or hard set. (More about clean break later.) According to my usual sources, ¼ tsp of calcium chloride (CaCl2) added to 64 oz (2 litres) of milk will help to overcome the effects of ultra-pasteurization. (CaCl2 is a salt commonly used in brewing and brining. Before you use this salt, be sure to read the Precautions below.) Well, I tested ultra-pasteurized goat’s milk 3 times, alone and with CaCl2, and never got a clean break. All of the dairy was dumped. Next I ran 2 tests of regular pasteurized goat’s milk, with and without CaCl2. Both gave me a clean break and I was able to make feta cheese with the curds. Now, since some of you might not be able to get goat’s milk, I ran 3 tests using whole cow’s milk. 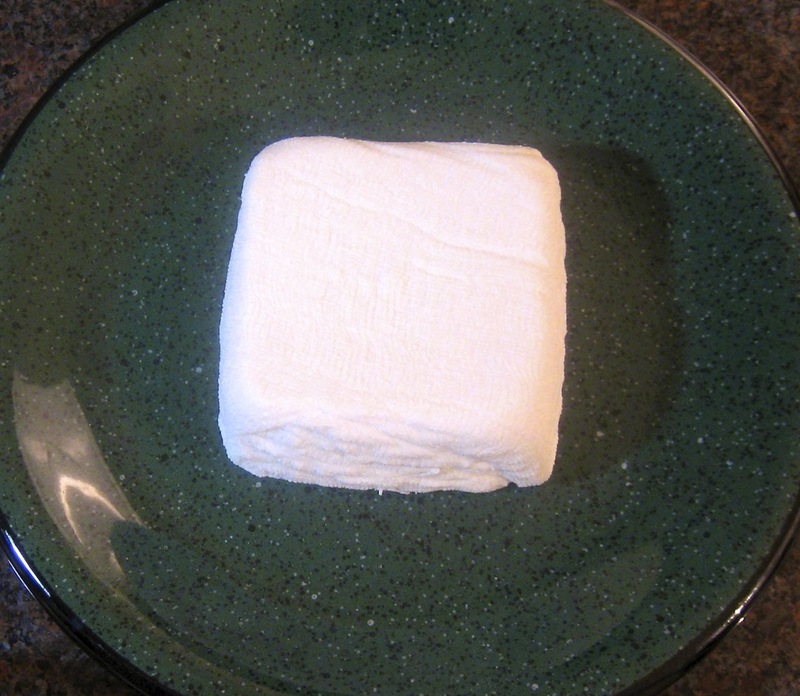 In the first test, I used regular pasteurized milk, alone, and a clean break was achieved and feta made. In the second test, I used ultra-pasteurized milk to which ¼ tsp of CaCl2 was added and a clean break resulted and I made feta cheese. In the third and final test, I didn’t add anything to ultra-pasteurized cow’s milk and I did not achieve a clean break. The dairy was dumped. So, the long and short of these tests is that you cannot use ultra-pasteurized milk, alone, to make feta. If your only choice available is ultra-pasteurized cow’s milk, you must add CaCl2 to mask the effects of the ultra-pasteurization process. CaCl2 will not work with ultra-pasteurized goat’s milk. Take the easy route: find and use regular pasteurized goat’s or cow’s milk and you’ll be fine. Of course, if you can get raw, unpasteurized milk, there’s no need to add anything. You’re good to go! Once you’ve warmed the milk, inoculated it with yogurt cultures, added rennet, and let it sit overnight, you’ll need to see if it has set properly. This is the your first real hurdle. Unlike with the other cheeses, this process will form one large curd. Stick your finger, on an angle, into the curd and slowly bring the finger to the surface to test for a “clean break,” meaning the curd is firmly set from top to bottom. 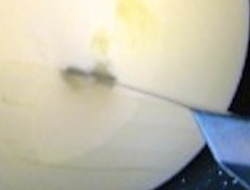 On the left is a picture showing a ‘bad break.” You can see that the curd hasn’t formed and all you’ve got is a thickened dairy product or, perhaps, a very thin curd floating atop thickened dairy. On the right are examples of a “clean break,” where the curd is firmly set throughout. If a clean break hasn’t been achieved, let the dairy sit for another 2 hours and check again. If still not a clean break, let it sit another 2 hours. If at this point, you’ve not received a clean break, you probably won’t and, as far as I know, all you can do is dump it and start over with fresh milk. Failure to use live cultures to inoculate the dairy. Using too much/little live cultures to inoculate the dairy. Over-heating the dairy and thereby killing the live cultures. Once the rennet has been added, the dairy must not be disturbed. Even moving it slightly may prevent the curd from forming. My advice is to move the dairy to the spot where it will remain overnight and then add the rennet. The Fates are messing with you. One more area to watch involves brining the cheese. For starters, the brine will affect both the taste and texture of the cheese, as well as extend its shelf life. To be successful, you’ll need an acidic solution that is 12.5% salt and it’s easy enough to achieve. Whey is already mildly acidic and you want to reserve it when you strain out the curds. Add 5½ tbsp of kosher salt for every 20 fluid ounces of whey and mix it, dissolving as much of the salt as you can. 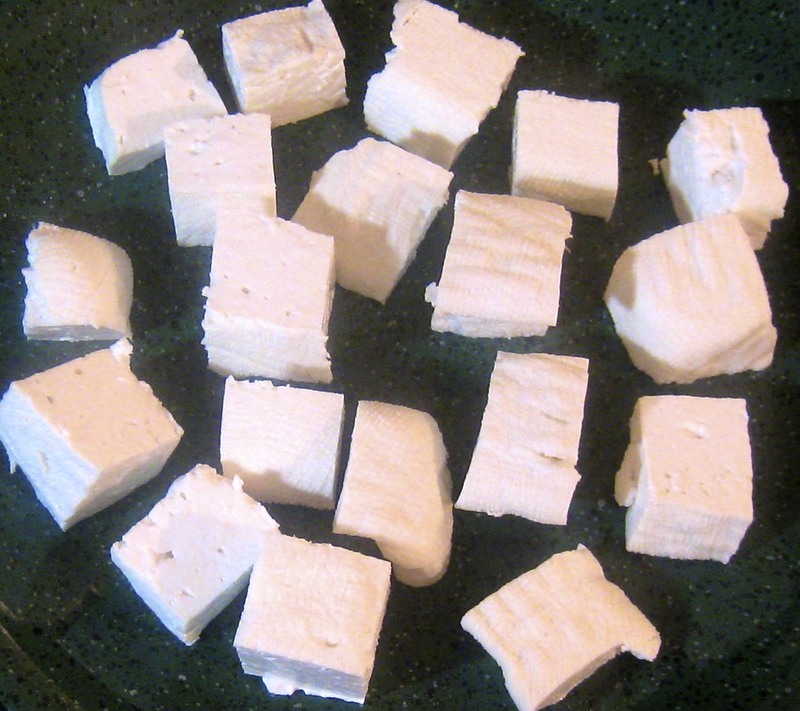 Cut your feta into cubes and place them in the brine solution. The feta should remain there to pickle for a minimum of 5 days and, according to Still Tasty, no more than 3 months. When you remove the feta, if the exterior is slimy to the touch, the brine solution didn’t contain enough salt. I don’t believe anything can be done to save the cheese and eventually it will completely dissolve. If the feta feels fine, it can be eaten after 5 days. Keep in mind that the longer it sits in the brine, the more flavorful it becomes and the easier it is to crumble. Most will prefer to rinse it gently with tap water before use. (If necessary, add diluted calcium chloride to the milk and mix well.) 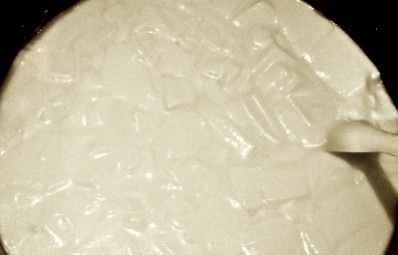 Place milk in a non-reactive pot with a lid. Gently heat the mixture until 86˚F (30˚C), stirring occasionally to prevent scalding on the pan’s bottom. Remove from heat, add yogurt-milk mixture, stir well, cover, and let sit for 1 hour at room temperature. Move pot to where it will remain undisturbed, add dissolved rennet, stir quickly & well, cover, and leave overnight. Once a clean break is achieved, take a long knife or, as I like to use, an offset spatula, and starting at on side of the pot, cut a straight line through the curd. Once the opposite side has been reached, create another slice about ½ in front of the previous cut. Repeat until the entire curd has been cut into horizontal slices. Give the pot a quarter turn and, starting at one end of the pot, repeat the slicing process. 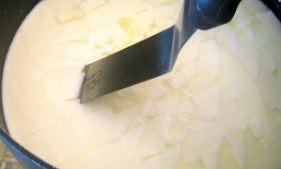 When finished, the curd should be cut into ½ squares. Now take the knife or offset spatula and, with the blade on an angle, slice through the curds from side to side at ½ inch intervals. This will cut the curds beneath the surface. Repeat this step twice, turning the pot and cutting the curds on an angle each time. Once the curds have been cut, gently stir the curds and check for curds larger than ½ inch cubes. If found, cut them to size. 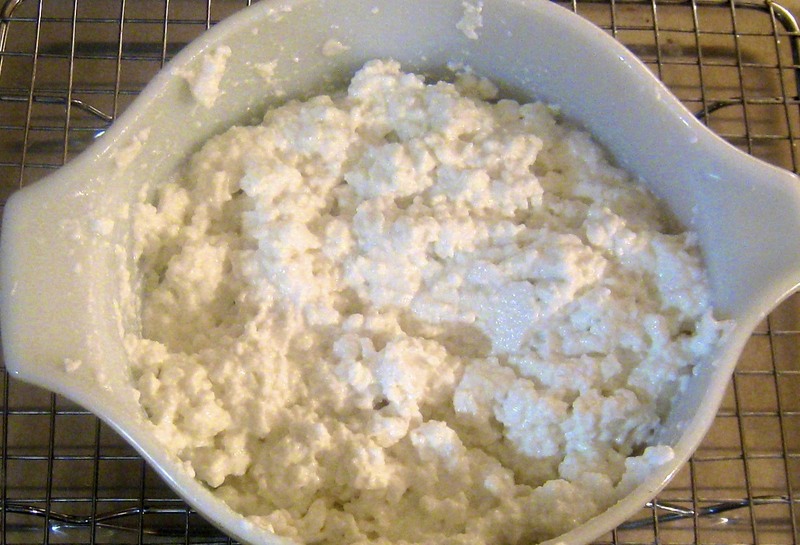 Let the curds rest for 15 minutes, gently stirring them 3 or 4 times that time period. The curds will shrink during this period as more whey separates from them. Next, line a strainer with cheesecloth or a hankie and place both over a large pot or bowl. Gently pour the curds and whey into the center of the cloth-lined strainer, saving the whey at the same time. 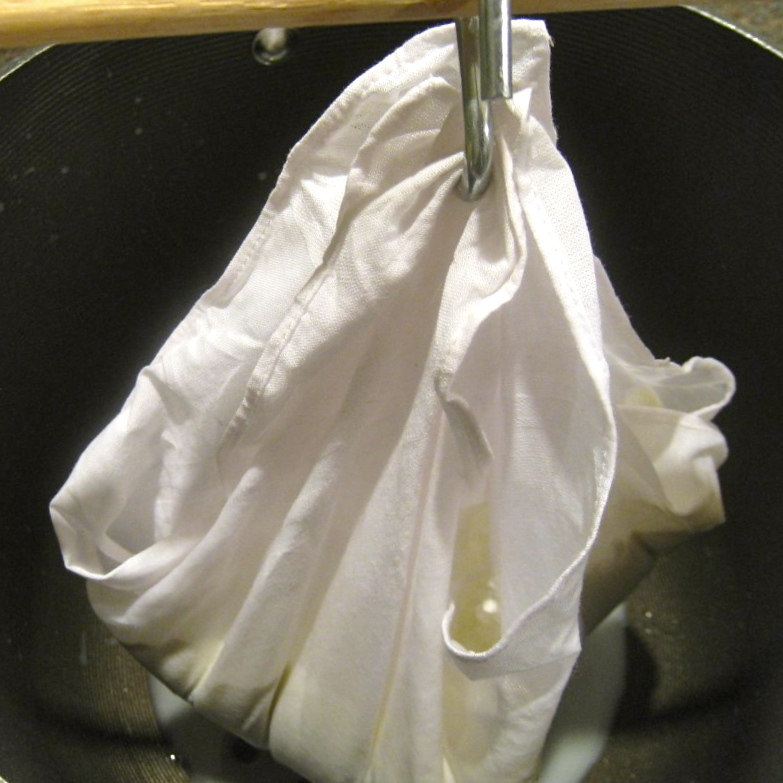 Once all the curds have been poured, grab the cloth’s 4 corners, making a “packet”, of sorts. Tie the corners together and suspend the cheese over the bowl or a pan. Allow it to drain for 2 to 4 hours. If unusually warm, this may be done in the fridge. Remove the curds from the cloth and place in a large bowl. Season with ¼ tsp table salt and stir, breaking up the curds as you do. The cheese will resemble cottage cheese when finished. Line a large can (open at both ends, one lid saved) or feta cheese mold with cheesecloth or another hankie. Place the curds into the form and cover the top with the ends of the cloth. Use the place the can lid atop the curds and place a heavy weight on top. This will force the remaining whey out of the curds, creating a block of feta. (See Notes.) Leave it overnight. If quite warm, place in the fridge. The following day, unwrap the cheese and cut it into cubes. Place them into the brine solution, cover, and refrigerate for at least 5 days. After 5 days, remove a bit of cheese and gently rinse it under running water before tasting it. Depending upon your preferences, you can either use it or return it to the brine to pickle further. Feta will keep for up to 3 months in the brine. As it ages in the brine, it will crumble more readily. 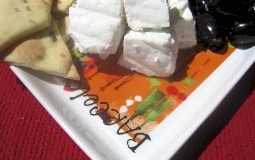 If, at any time, mold appears on any of the feta, discard it and everything within that container. Calcium chloride has a wide range of uses, from medical applications to keeping our paths clear of snow and ice. If you buy some, be sure it’s of a grade fit for human consumption. Buying it from a cheese making site or home brewery supply house should eliminate any concerns you might have. As calcium chloride is dissolved in water, a small amount of heat is released. This is of little concern, especially given the small amounts we’ll be using. Burns can result, however, if the dry crystals are ingested. Please, KEEP CALCIUM CHLORIDE CRYSTALS OUT OF CHILDREN’S REACH AND AWAY FROM PETS. The heavier the weight used to press the curds, the firmer the brick of feta will result and the quicker, too. With the right amount of weight (pressure), you should get a firm brick of feta if left overnight. You can buy cheese presses or find instructions for building your own on the internet. If you’re at all inventive, you can save yourself the money and rig something. I placed a filled bottle onto the curd-filled form and placed it all on my grill. It was tall enough so that when I attempted to close the grill cover, the lid rested atop the bottle and it’s weight supplied all the pressure needed. 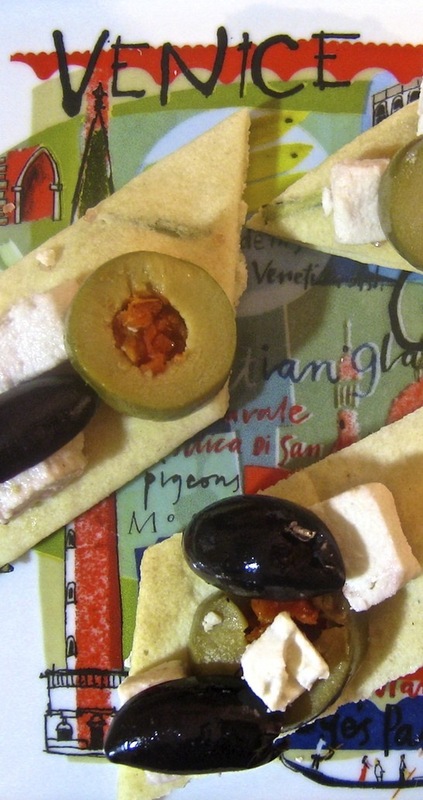 The next morning I had a firm brick of feta that I cut into the cubes that are pictured above. Do not panic if you neglect to reserve the whey or do not have enough. You can use distilled water in addition to, or in place of, the whey. Just be sure to use 5½ tbsp of kosher salt for every 20 oz of distilled water. Although I’ve never used distilled water, a number of sources successfully pickle their feta with it. Even so, because of its acidity, I would strongly suggest using as much whey as possible before resorting to distilled water when making the brining solution. If you have slimy cheese after pickling, there are a few things you can try with your next batch. The Curd Nerd website may be of help. The next and final cheeses in the series will be mozzarella. You may not realize that there is more than one kind of mozzarella. There’s “American Mozzarella,” which you’ll find grated, in bags, and hanging in a display among assorted cheeses at your neighborhood grocery, and then there’s “Italian Mozzarella,” which you’ll find globe-shaped and packaged in liquid, normally whey. American Mozzarella is usually melted when served. (Think pizza.) Italian Mozzarella is served as-is or sliced. (Think Insalata Caprese.) Like feta, making them at home can be a bit of a challenge but, of the two, American Mozzarella is easiest. In fact, kits are sold for just that purpose. As always, we’ll take the easy route first and make American Mozzarella. A few weeks later, we’ll close out the cheese series when we make Italian Mozzarella. You may have noticed that 2 plates used above have a certain cosmopolitan flair. 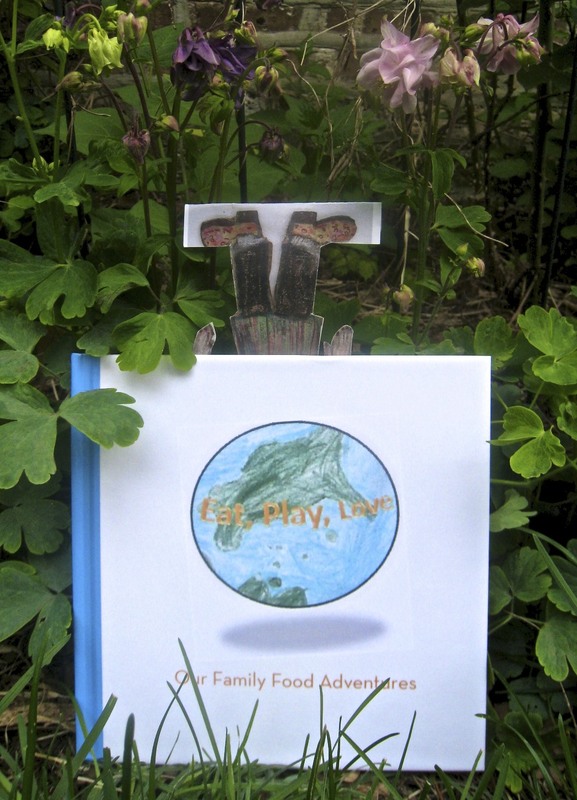 The plates, “Barcelona” and “Venice“, are 2 of 6 that I won, along with a very limited edition cookbook (pictured, right), in a give-away sponsored by the Our Family Food Adventures blog. So, to Kristy, Mike, and my 2 favorite Sous Chefs in the whole, wide world, Miss A and Mr N, thank you very much for these generous prizes. Both cookbook and plates are sure to bring a smile whenever I use them. This entry was posted in Home-Made Cheeses, Make It Yourself, Vegetarian and tagged Cheese, Feta, Food, Italian, Recipes by ChgoJohn. Bookmark the permalink. As for the testing, I knew that I got good results using “regular” pasteurized milk. I wasn’t sure about the others and didn’t want some one to dump their dairy because I wasn’t specific. I want everyone to have a high success rate. Thanks for the laugh! No, no — thank you. The sheep on the milk carton image is priceless. Can you believe I have got all the ingredients for mascrponi for a few weeks now and I just don’t seem to find the time. Now this I must try! I love feta but don’t always find the firm type I love. I really can’t wait to try this! Thank you for the very informative post. You’re welcome, Sawsan. When you’ve got the time and are ready to give it a try, I’ll be here to answer any questions you may have. Good luck. I am making it today 🙂 I found someone who sells fresh milk and couldn’t think of something better to make with it. Good luck, Sawsan, and remember do not disturb the dairy once you’ve added the rennet and stirred it. Please let us know how you do. Fingers crossed! Thank you so much for the recipe and the detailed instructions. I can’t believe I made feta! YAY!!!! Congratulations! When I hadn’t heard from you, I began to worry whether you’d run into problems. It can be so disappointing — not to mention frustrating — when the curds don’t set. I’m glad you found my instructions helpful. Did you use cow’s or goat’s milk? Was it pasteurized or raw? I’ll be interested to learn what milk you used and whether you enjoy the taste. I am sorry it took me a long time to write back, I was waiting for the 5 days brining time to end, I was actually really worried midway but things worked out well. I used raw goat milk, before brining I was worried that it tasted too close to labneh but after brining it turned out amazing. Certainly no need to apologize, Sawsan. I’m just glad that you had such great success. Like you, I tasted the cheese before brining and wasn’t at all impressed. Thank goodness for that brine! I wish I knew where to find some raw goat’s milk. I bet it gave your cheese far more flavor than mine. I hope Eva reads your comments. She’s very interested in making feta and your success could prove encouraging for her. Again, congrats on your success. Sawsan, and thank you for letting us know how it went. What a detailed post John and I think you are marvellous to take to so much trouble to talk about what problems can occur and how to sort them out. We are very lucky to have your posts on making cheese! Thank you! Thanks, Roger, and I am so in agreement with you. If I had your access to fine cheese, I’d never make another curd in my life, to be sure. Even now, I don’t imagine I’ll be making much feta. Using pasteurized dairy, it tastes rather bland and imported feta made from sheep’s milk is so much better. Still, I did want to show anyone interested that it can be made at home relatively easily and without purchasing expensive equipment. Thanks, MD. This was the toughest one yet but we’re nearing the finish line! Yay! I´ve been waiting for this 🙂 No lactating sheep in the Chicago area?! How surprising…..Lucky me, I can get fresh, unpasteurised goat´s milk. Will have to track down the calcium chloride and see if I can get rennet in quantities other than industrial…but I will, I will! So much work in the post post John, we do appreciate it. And I love those plates, well done to you! Thanks, and that’s great, Charlie, that you can get raw dairy products. The organic food movement is lobbying for change here but it’s a slow process. The dairy industry is against it. Still, despite these past couple months, I don’t make that much cheese to care one way or the other. If I were to venture into making the hard cheeses (parmesan, cheddar, pecorino, etc.) then I’d be far more interested in finding raw product. As it is, pasteurized dairy works fine for the cheeses I make most often (ricota, cream cheese, and mascarpone). Excellent intructions John! I am marking this post along with the other previously saved cheese recipes. Looking forward to the Mozzarella Directive – Sounds like an Bourne movie! Feta makes it beta! But I’d rather try making something with the two cheese press bottles – hehehe. Congrats on the prize winning. With your own experience making parmesan, I knew you’d quickly get a handle on the feta making process. You take such care in feeding your animals, Celi, that any dairy product you use is bound to make one very tasty cheese. I do hope that, at some point, you use a little of your sheep’s milk to make some feta. Being it will keep for 3 months, it’s not like you’ll need to make feta often. I really hated dumping that spoiled dairy. Mom would not have approved at all. Having lived through the Great Depression, there was no greater sin than wasting food. As a side note. Have you ever considered getting a miniature/pygmy goat? From what I’ve been told, they give a ridiculous amount of milk for their size. (I know, just what you need. Another mouth to feed.) Have a great day, Celi! I do not think I will ever get round to making feta, but it was so interesting to read the process. I have learned a lot from your post – including the fact that lamb`s milk is used to make it. This I did not know. Thanks, Colline, I’m glad you enjoyed the post. I, too, learned a lot when I started making cheese. The biggest shock was how easy some are to make. That ricotta recipe is worth its weight in gold! This is such a detailed account on Feta making! I can’t wait to share it with my niece, who at fourteen, is our resident cheese maker. I think she would love to apprentice with the Bartolini Kitchen! Me, I think I am raring to go since i already have TWO of the necessary tools: 1) Grand Marnier and 2) Cointreau. I’m in! As I recall, Illinois law is something similar to that, April. I think the reason you must supply your own container is to limit the liability of the owner of the cow/goat/sheep should someone get sick from the raw dairy. I think that if I were to get serious about this, I could probably find some raw dairy when I visit my family in Michigan. I don’t make enough cheese, often enough, to seek it out. So long as I can make my ricotta when I stuff my shells or have fresh cream cheese when I make bagels, I’m happy. Oh, yeah! Mustn’t forget fresh mozzarella for when the tomatoes ripen. YUM! John Bartollni! I am so impressed by the exhaustive research, the scientific lab testing, the incredibly well-laid out instruction and photography and the finished plated cheeses ! This is an award-deserving post if you ask me! All in favor, say aye! (chorus of ayes to be heard!) Congratulations, John, this is absolutely stunning! Thank you so much! Aw, shucks, Spree, ’twasn’t nuttin. With this cheese and mozzarella, there are just so many places where something can go wrong that I just wanted to make sure I covered all of the bases for anyone willing to take the plunge. It really is disappointing, not to mention a waste of good dairy, when things go awry. What an amazing post, John, I think you deserve an award just for your cheese series and perhaps for this post alone! I’ve said it before and I’ll say it again, I so look forward each week to your posts because they are always, always so informative, instructional and just plain fun! What dedication you had in pursuing feta-making. If I ever get up to speed on cheese making, I will feel confident in attempting feta because I know you’re here. 🙂 So far, I’ve had ricotta on my to do list and even bought the ingredients to attempt it one weekend, and then we had my husband’s health issues come up and I couldn’t do it. I’m still playing catch up, so it may be summer before I get to cheese making, but I sure want to try. Thank you, my blogging friend, for sharing your experience in this wonderful and inspirational series! You’re welcome, Betsy. You’ve got your hands full right now and cheese making can wait. Don’t worry. I’ll be here when you’re ready. I know one thing for certain: you’re going to love the ricotta! Thanks for leaving such a complimentary comment. I can make cheese, please Sir, I can! I have one of those chesee presses – molds !!! How did you know feta was one of my favorite cheeses!? Oh my, I can’t even imagine how incredible this must taste. Funny story–so, your cheese series has inspired me to try making homemade cheese. When I told my roommate this idea, she laughed and asked if I realized how difficult it was to make. I told her yes, but that with your instructions and help I’m sure I could figure it out?! She still doubts me, but now I’m even more motivated to give it a try, ha! It seems that feta is a favorite for a number of people, Caroline. When you decide to make some cheese at home, make some ricotta. In less than 2 hours, you’ll have a nice “chunk” of ricotta draining in your kitchen. It really is that quick and the results are fantastic. The other cheeses are good, too, but not as fast to make. Your roommate will be shocked! John, how can I ever thank you for going to all this work and research? You’ve already got me making cheese, and I look forward to the challenge in trying feta now. Which happens to be Hubby’s favorite. He will love this! Thank you so much for doing all the testing for us, making it much more likely for success! Your blog is like having the best cooking class, and best cookbook available. You’re the best!! You’re welcome, Sarah, and thanks for leaving such a great comment. Sorry, Sarah, but I missed (or forgot) that you’ve already made ricotta. Well then, now you’ve got a good idea of what to expect and some experience with curds. You’ll have a better chance at success making feta. YAY! I do admire you making feta, but please can I be excused from this because I can buy Greek feta and also sheep’s milk cheese made in France? You’re right that in the EU only Greek-made cheese can be called feta and the one I usually buy, made in France but to the same method, is simply labelled ‘pure brebis’ – pure sheep (milk). When I was young in Turkey we ate a lot of this type of cheese and there it was called ‘beyaz peyniri’ – white cheese! I love it and eat it almost every day, but I don’t think I’ll be making it for a while! What an incredibly detailed post. Anyone that wants to make cheese will really be fortunate if they find your blog. Great job John! LEt’s have a giant cheese making party! 🙂 This looks fun! I’ll bring wine too… A LOT! Well, then. I’ll just get some cheese at a deli. PARTY! 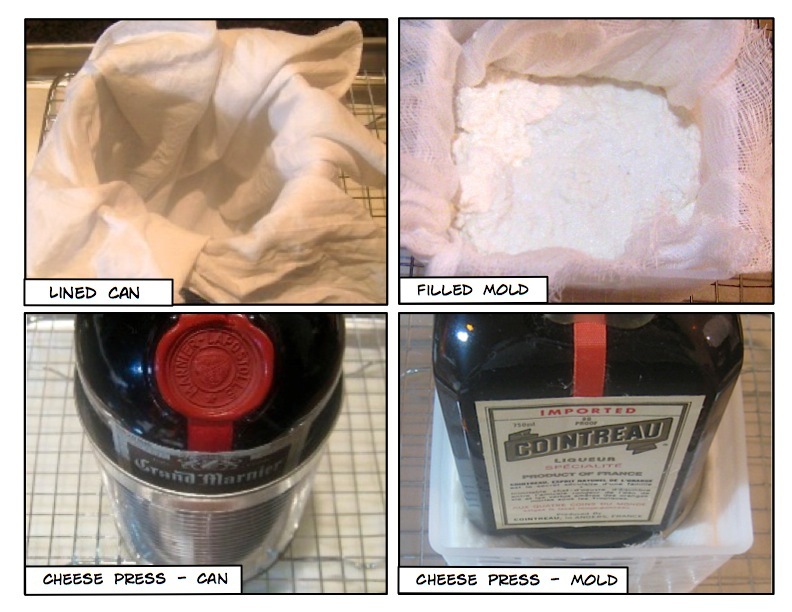 Love your cheese “press” and “mold”…how’d you get the darn recipe made?!? I just heard about a dish called Poutine. Apparently it’s Canada’s dirty little secret and their undeclared National food – it’s French fries with gravy and cheese curds. Whoa. This looks wonderful. I’ve heard of poutine, too. I wonder what kind of milk was used to make the curds? I am learning so much from your blog. Thanks for your indepth instructions. Thanks, Debra. I have to admit that this isn’t a cheese that I make frequently. I’d much rather pay the extra money to get some imported feta with some real flavor. 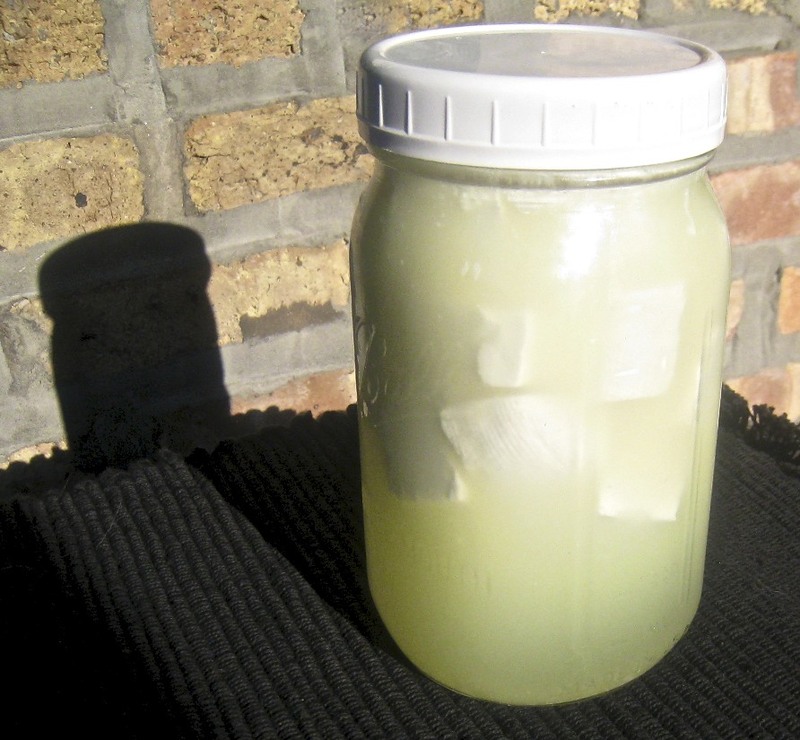 Pasteurization really does affect home-made feta’s taste. It’s still a good cheese and great to know how to do it but I prefer something a bit stronger. Although I am fairly certain I will not attempt cheese making (perhaps in retirement?) I enjoy reading your detailed instructions and information and I learn a lot. What impresses me most is your dedication and determination to make it seem like a possibility for the person who knows nothing about cheese making. I know your “product” is delicious and your multiple methods to seek the superior outcome is admirable. This week is the Greek Food Festival at a big Greek Church in the city and you should see the line for take out! Their feta probably can’t compare to your feta made with so much love. Your prizes are cool. What fun to win! I will have to check out that blog, too. And I know everyone appreciates your public service announcement but I see no change from WP to rectify the “improvement”. Ah! Greek festivals. Love the food! I certainly can understand how you feel about making cheese, Ruth. I only made feta again for the blog posting. Even though this feta is very creamy, it’s a lot of work and I prefer the stronger flavor of the imported over the home-made. If I could get some raw goat’s milk, it would be a different story but, since only pasteurized milk is available, the payoff isn’t worth the trouble, for me anyway. I will, though, continue to make ricotta, mascarpone, cream cheese, and mozzarella. The results of these are definitely worth the effort. Should you get bored one afternoon, though, I strongly suggest you make ricotta. You’ll be amazed at how easy it is and how good and creamy the result. It is far better than anything you’ll ever buy. As I just told Ruth, make some ricotta first. 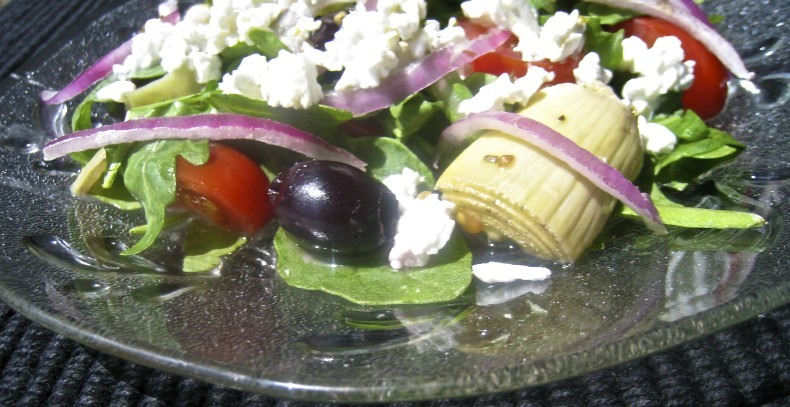 It is so easy to do, the results are terrific, and it’s a great confidence builder should you decide to try a more challenging cheese recipe like feta. And all you need is some cheese cloth, whole milk, and vinegar. It couldn’t be simpler. Thank you, thank you, thank you! I am so thrilled that you posted this recipe, John, and particularly impressed with your experimentation notes and tips. I thank you for them in advance as I can certainly see how it will save me time and money. I have some questions. We have a very limited range of feta we truly enjoy and will pay significantly more for it (we have to in Toronto). Does the cow’s milk make a creamy feta or it is dry and plastic-like as the supermarkets sell? I love the sheep’s milk feta because of its smoothness and not the harsh salty, hard feta that the cows milk supermarket variety is. Can I expect a significantly better product if I make it at home? Thanks again, John. This is likely ending up on my list of have to try recipes. After brining for 5 days — that’s the minimum time for pickling — my feta, whether goat or cow’s milk, is creamier than the fetas I bought. (I bought a Greek feta (sheep’s milk), a French feta (sheep’ milk), and a “local” Greek (cow’s milk).) Now, a couple weeks later, my feta is still creamier than the “local” Greek and about even with the Greek import. Of the 2 batches I have left, I found that the goat’s milk cheese is a bit creamier than the cow’s milk, but not by a great deal. And the goat’s milk cheese is a week older than the cow’s milk. That may play into it, as well, meaning the difference may be more pronounced if they were the same age. As for the flavor, I prefer the imported French feta made from the sheep’s milk. It has an almost Pecorino Romano flavor to it. Mine doen not. I’d say mine tastes better than the “local” Greek — that’s just a bad cheese, IMO — but is about par with the imported Greek. The one thing about mine is that it can be salty if you do not give it a good rinse. Personally, I don’t mind a little salty, depending upon it’s use. I think it’s great on a salad, for example. I’m currently looking at a spanakopita recipe in an old Greek cookbook that I own. I’m not s sure a salty cheese would do well here so I’ll give it a real good rinse before I use it. Thanks John. I’ll HAVE to try the recipe. It’s a bit of a challenge for me and from your remarks, sounds like it’s worth the effort for the flavour! Another thing to add to my bucket list! I’ll look forward to your Mozzarella recipe, which is something I probably won’t try myself! but you never know! That’s great, Eva. For me, I’m much more impressed with the mozzarella results and look forward to making it again and blogging about it. First, though, I’ll be going home for a visit and I’ve postponed it all until I return. Very impressive! You have this down to the science. Man you would be an awesome guest instructor for a culinary arts program or for a food science class. I don’t have the patience to make my own cheese, but will definitely send this over to my uncles. I like cheese made from goat and sheep, definitely has more flavor! Thank you, Lisa. I just don’t want people to run into some of the problems I have. I understand that feta making is far too time consuming for you. Heck! I may not attempt it again. I’ve had my fill o’ feta, of late. The ricotta recipe, though, is much simpler, quicker to make, and the results fantastic. That one I’ll make again and again. In fact, I’ve not bought any ricotta since finding that recipe. That salad looks right out of a restaurant. Your feta looks perfect. And I love that you use the good liquor to press it. Thanks, Greg. As for the cheese presses, you & Katherine taught me well. Only use the best. Granted, you guys are mixing fabulous cocktails but the original premise still holds. Sorry, Spree, but this one was all me. I was creating the post you described but hit publish, obviously, when I shouldn’t have. That post will be coming but not for a while. I’m trying to get a couple posts “in the can” so that I can devote my time to writing the mozzarella instructions, as well as creating a few batches of cheese for the photos. Like those for feta, these instructions are pretty involved and I want to make sure I’ve covered all bases. Again, sorry for any confusion my error may have caused. This is definitely on my to-do list. I love feta cheese. We go to Mediterranean market to get our feta. Our favorite is French feta. It’s impossible to get real Greek feta in Texas. I agree. My favorite is a French feta made from 100% sheep’s milk. This that I make is not as flavorful as that one. (Darn it!) I think the fault lies in the dairy. I cannot get raw milk nor can I find sheep’s milk. Sheep’s milk is very flavorful and makes a far better cheese than I can do with pasteurized cow or goat’s milk, unfortunately. Well, you can try something like ricotta first. It’s far easier and will “get your feet wet” in the cheese making process. And I’ll be here to answer any question you may have. Thanks for stopping by. John, this is such an informative post. Great information on the how to and hats off to you for being so diligent to try such a difficult cheese. I am heading off to Italy this upcoming week. I am planning on eating my way through Italy! Thanks, BAM, for your comments. I’m so glad for you, traveling to Italy and wish I could stow-away. I’ve been away 10 years now and really would like to return. I’m sure you’ll have a wonderful time. Just remember: leave no pasta behind! Buon Viaggio! I am late at getting to the party. How many days/weeks did you spend experimenting? Thanks for the detailed info. Sure save us a great deat to time, money and frustration. Hello, Norma. The testing was spread out over about a month. I took my time with it and with writing the entry to make sure that I covered everything. I wanted to spare anyone who tries this the disappointment of having to dump their dairy. Thanks for commenting. I love the gorgeous salty bite of Feta…thank you SO much for sharing this!! Glad to be of help, Squishy! Thanks for stopping by! I love feta cheese! Not sure I’ll be making it any time soon, but’s it quite interesting to see how it’s done. And I just bet it tastes delicious! It is a good cheese, Mar, but a bit complicated. I’ll make it again but I won’t be in any hurry to do so. Besides, I’ve moved on … Mozzarella is next! Hi John – I just wanted to drop you a line to let you know that I gave this a try. I couldn’t get some of the ingredients so I had to cobble things together a bit and it was a bit hit and miss in the beginning. The rennet for example – I got some weird sachets of stuff which had something, something and rennet inside. They were designed to be used for making “fromage blanc”, so I just thought “what the hey” and added two of them. Not sure how much that compares to rennet tablets. In any case, the next day I checked for a clean break, fully expecting a pan full of of sloppy curds. I actually let out an audible exclamation of “holy crap, it worked” when my finger came up with a thick, smooth layer of curd on top. It’s in the fridge now, brining. I tried a little piece already and it was very creamy, but as you said… a bit nondescript so far. I fully suspect that it’ll be great once I’ve brined it for 5 days or so. You’re very welcome, Charles, and what great news! I’m so happy that you got a good curd your first try. It can be so frustrating to find nothing but a spoilt mess in the pan, especially for one’s first attempt. Believe me, I’ve thrown away far more dairy product than I care to admit. On the other hand, a successful batch of feta or ricotta or mozzarella makes it all worthwhile. As for your feta, it will definitely grow more flavorful as it brines. I hope you like the end-result as much as I do. Enjoy your family’s visit and good luck with your cheese making. I’m here if you have any questions. Hi John, thought I’d get back to you. I made two batches of the feta. The first batch was good, but I screwed up the brining a little so it was super salty. The second batch I didn’t have quite such a clean break but I forged ahead and it ended up fine. I added it into the same brine and just diluted it some more so it all got mixed up with the first batch. Generally I was very pleased with it – thank you – although I will admit that it wasn’t quite like the feta I buy. It was very, very creamy. Perhaps as a result of using raw cow’s milk, instead of sheep’s milk perhaps? I have no idea where I could source the latter from so I think I’ll have to stick to cow’s milk for now, but you’ve really awakened an interest in me in cheese making. Next up I want to try to make cheddar which looks like a lot of fun! Good for you, Charles! I’m glad you were able to make some and are pleased with the results. I’ve found that my cheese hardens as it sits in the brine but I’ve never used raw cow’s milk. I envy you that and yes, using sheep’s milk would make a big difference but I cannot find that either. In fact there are laws against selling raw milk. I applaud your intentions to make cheddar cheese. At one time, I considered trying to make one of the hard cheeses but I would have needed to construct a storage area and, frankly, just how much cheese does one person need? I’m nonetheless eager to see how successful you are with it. Good luck and thanks for taking the time to come back here and tell me how things went. Thanks, Christina. This is about the easiest cheese to make. A number have tried it and all say the same. Give it a try. You won’t be disappointed. John, you are the connoisseur scientist of feta cheese! Thank you for all the time that you spent on this! I love feta cheese and I am not going to attempt this beautiful recipe. You are the master of preparing homemade cheese! Looks absolutely delicious on all levels. And one could never partake in store bought feta again after tasting your recipe! Hope you don’t mind if I reblog your link on my reblog page? You are so kind, Judy. Being unable to get raw milk of any kind, I wasn’t expecting to make a really good feta. I happen to love imported feta made from sheep’s milk in France. I was, then, surprised to see just how flavorful this was. No, it’s not as good as that French feta but it is very good, nonetheless. Of course, I do not mind, Judy. I’m honored that you would even consider reblogging a post of mine. Thank you.